New traffic lights began operating Thursday at the intersection of Academy Road and Harrow Street. The area has seen a rise in traffic congestion over the years, especially during the morning and afternoon rush hour. 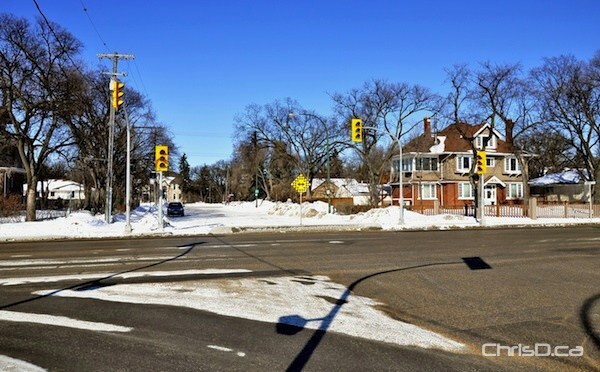 The lights at the three-legged intersection are flashing amber and red for their first week in operation and will begin operating normally next week. Residents in the area have been wanting to have the cement barrier, which blocks northbound Harrow Street, removed to allow for free-flowing traffic on Harrow. Residents say the lights are setup in a way to accommodate the removal of the barrier in the future and allow traffic to flow again. While the lights do appear to have the ability to serve traffic in that particular direction, the City of Winnipeg reiterated that there are no plans to remove the mysterious barrier. “It is (the barrier) part of the signalized intersection design and will remain,” a city spokesperson told ChrisD.ca in an e-mail. The barrier became a hot button issue in River Heights during the 2010 civic election.